Striking workers: Egypt’s new military-led government has adopted the same tough line on labour activism and trade unions as its predecessors. Credit: Cam McGrath/IPS. 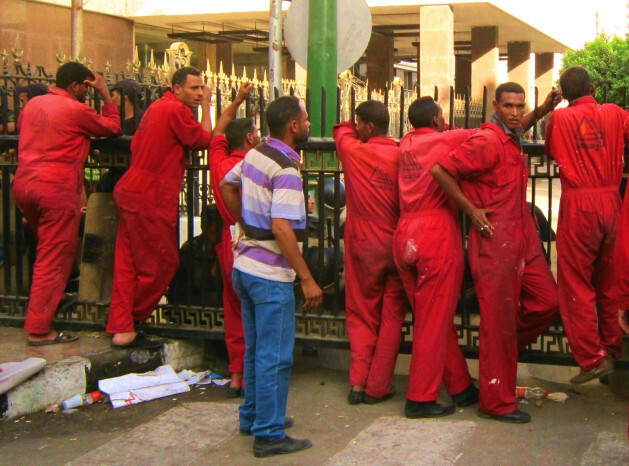 CAIRO, Sep 9 2013 (IPS) - It was the Egyptian state’s brutal restrictions on worker freedoms that transformed Kareem El-Beheiry from a disengaged lay worker into a tenacious labour activist. In April 2008, El-Beheiry was arrested during mass demonstrations that followed a government crackdown on workers protesting low wages and rising living costs in Mahalla El-Kubra, an industrial city 100 kilometres north of Cairo. The young factory worker had used his mobile phone to capture and share video footage of fierce clashes between security forces and protesters until police swooped in and grabbed him. Authorities accused El-Beheiry of using his blog on labour rights to instigate the Mahalla uprising, which originated at the textile mill where he worked. Three people were killed and hundreds injured in two days of rioting that engulfed the city after state security forces stormed the factory to prevent thousands of striking workers from gathering there. The Egyptian Centre for Social Rights reported 1,400 collective worker actions in 2011 and nearly 2,000 in 2012. It cited 2,400 social and economic protests during the first quarter of 2013. El-Beheiry, now 28, recalls how he spent two months in prison, where he was abused, deprived of food, and tortured with electric shocks. Even after his release, he had to fight a legal battle to return to his job – the factory’s manager had sacked him for failing to show up for work during his imprisonment. Reinstated on a court order, the flagged employee was transferred to the state-owned company’s Cairo office in 2009, where he was fired three months later on spurious charges. El-Beheiry’s ordeal exemplifies the extent to which the authoritarian regime of toppled president Hosni Mubarak was willing to go to isolate and intimidate dissident workers. The state tolerated a degree of political opposition, but when it came to labour issues, any action that threatened to galvanise workers into a cohesive labour movement was swiftly crushed. Successive governments relied on the Egyptian Trade Union Federation (ETUF), a colossal state-backed labour organisation with 24 affiliated trade syndicates, to control workers and prevent them from engaging in industrial action. When strikes did break out, the regime smothered them with the riot police and hired thugs – and if that failed, called in the army. “Mubarak only knew one way to deal with labour disputes: force,” says El-Beheiry. The former mill worker, now a project manager at an NGO that helps workers unionise, says the 2008 Mahalla revolt was a game changer for Mubarak’s regime. The labour movement that emerged from the city’s grimy factories stirred Egypt’s long-quiescent working class, sparking a wave of wildcat strikes that played a crucial role in persuading the army to remove Mubarak during the 2011 uprising. But the strike wave did not end with Mubarak’s fall. It smouldered and spread under the 18 months of military rule that followed, and during the year-long rule of president Mohamed Morsi, a former leader of the Muslim Brotherhood. The Egyptian Centre for Social Rights (ECESR) reported 1,400 collective worker actions in 2011 and nearly 2,000 in 2012. It cited 2,400 social and economic protests during the first quarter of 2013, which coincided with Morsi’s presidency. Joel Beinin, professor of Middle East history at Stanford University argues that despite small concessions aimed at ending strikes, Morsi largely relied on the same apparatus to quash labour dissent, and proved no more willing than his predecessors to address its underlying causes. At the heart of the underlying causes lie gross inequalities. Many of the demands are not new. During the twilight years of Mubarak’s rule, the government’s neo-liberal economic programme heightened unemployment, stripped welfare benefits, and widened the gap between rich and poor. Economic conditions have continued to deteriorate in post-revolution Egypt. Impoverished workers are protesting for better wages, job security, payment of overdue benefits, and a liveable minimum wage. They have also demanded to exercise the right to freedom of association as guaranteed by international labour treaties to which Egypt is a signatory. Workers have organised into thousands of independent trade unions since Egypt’s 2011 uprising, but their legitimacy is challenged by Mubarak-era legislation that only recognises ETUF-affiliated syndicates. Despite some promising signs, including the appointment of a veteran union organiser as labour minister, rights groups say the new regime is already shaping up to be a lot like its predecessors. In August, security forces moved in to break up a month-long strike by steel mill workers protesting unpaid wages and bonuses. Days later, riot police forcefully put down a strike at a petroleum company over unpaid bonuses and intolerable working conditions. Strike leaders have been sacked, and several protesting workers were reportedly referred to prosecutors under laws that criminalise unauthorised collective labour action. The ruling regime has attempted to paint striking workers as counter-revolutionaries and members of the Muslim Brotherhood, a loaded association given the military’s crackdown on the group. Military leader General Abdel Fattah El-Sisi has called on workers to take action against the “instigators” of strikes, and promised to deal firmly with those who disrupt the wheels of production.